Two years ago, Alina Maschik missed her shot at one of the world’s most wanted terrorists. Now he’s back. Her objective is simple: complete her mission. But when the target leads her back to her hometown in New Jersey, the situation is anything but simple. Now, Alina must face her past as she races against an invisible clock. Free on Kindle. 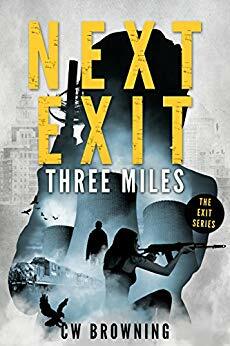 Visit gagaoverbooks.com daily and download more books like "Next Exit, Three Miles" . We're dedicated to bookaholics, and each day we feature new free and discounted Kindle ebooks in the genre as well as other categories of fiction and non-fiction. Disclaimer: The price of Next Exit, Three Miles was accurate when this post was published on February 28th, 2019. However, Amazon can and does change Kindle book prices frequently and without notice. Always look closely at the price of an ebook on Amazon before clicking that yellow button. If you purchased a Kindle book by accident, it's simple to return, just follow the return instructions here.